Most bus routes here are infrequent, with buses no more often than every 30 minutes. What would count as frequent? I’m sure the majority of those who don’t use transit think every 15 minutes is frequent. But I’d bet most would change their minds after going to a bus stop and waiting 10-15 minutes (or more) for such a “frequent” bus. In the abstract 15 minutes isn’t much time, but at a bus stop it’s forever. Which is why truly frequent service is every 8 minutes or better, which doesn’t allow much time for getting annoyed with waiting. If using schedules or trip planners, any frequency increase certainly improves the transit experience. But though we are tempted to think of 15 minute service as being frequent, it just is not good enough to be painlessly used without schedules. The difficulty with middling headways of 15-20 minutes is that while it seems like one should be able to use the service without a schedule, in practice doing so is not advisable. Even schedule-using riders may be more lax following the timetable than with avowedly infrequent service, and so more likely to just miss the bus — leaving them to wait the full 15 minutes until the next one. Transit agencies, politicians, and transit advocates should call a spade a spade, and only refer to transit services as frequent if they can be used painlessly without a schedule by most people — and not just the transit-dependent, either. There’s many bicycle shops around here, with at least four on King Street in Kitchener-Waterloo. Each one is filled primarily with bicycles that are designed for recreation, and that incidentally can also be used for getting around town. If you watch what people actually use to cycle for transportation here, it’s those kinds of bikes, and not ones which are well-prepared for the task. As the owner of such a bike, I end up being a fair-weather daytime non-winter cyclist, and I leave the bike at home when I fear the situation may become unfavourable. My bicycle does not prepare me for such mundane things as: rain, snow, road salt, night, luggage, or comfort for that matter. With the lack of availability of European utility bicycles and current bicycle shops’ interest in maintaining a focus on recreation instead of utility — in Kitchener-Waterloo and in most other North American areas — a utility bicycle shop has the potential to do quite well. I envision a place where you know you will be able to go in and have your pick of many different bicycles that are outfitted for utility: fenders, lights, chain guards, skirt guard / coat protector, a rear rack, an upright seating position, step-through frames, baskets, and internal hub gearing and brakes. Such a shop would sell and maintain quality bikes that are designed for many years of frequent use in all weather. 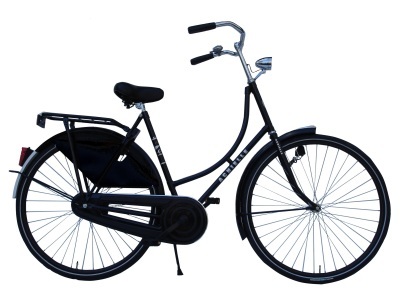 The picture at the top of the post is of a Dutch-style omafiets (grandma bike), which is the epitome of this kind of bicycle. Beyond the regular utility bikes there should be all manner of cargo and family bikes, work bikes, folding bikes, and a wide array of baskets and panniers. In addition to serving an unfilled niche, such a store would encourage cycling as transportation by making it easier to do. One wouldn’t have to figure out how to haphazardly add all of the aforementioned useful components to a bike, or to worry about whether their externally-geared bicycle will survive the winter. A store with a utility cycling focus would make it easy to buy a bike actually suited to its intended use. It would generally be more expensive (think $700-1000 and up), but still nowhere near what cars cost. Many people would be quite willing to pay for the quality and convenience of a solid European bike that can be used to ride to work or to the store in style and comfort. Particularly when they start seeing others on such bikes. And as cycling conditions continue to improve, so will sales. To be sure, there are such stores in North America: Curbside Cycle in Toronto; Downtown Bike Hounds in Hamilton; Flying Pigeon LA; Dutch Bicycle Co. in Somerville, MA; Dutch Bike Co. in Seattle and Chicago; My Dutch Bike in San Francisco; Clever Cycles in Portland; and Rain City Bikes in Vancouver. But there should be many, many more. Their absence isn’t the only barrier to cycling, but it is one, and I suspect that in urban areas ripe for cycling (e.g. Waterloo Region), removing that barrier could be good business. Addendum: Some more shops for the list: BikeBike in Calgary, RedBike in Edmonton, Natural Cycle in Winnipeg. Addendum 2: In a later post I have a reasonably comprehensive list of North American utility bicycle shops.